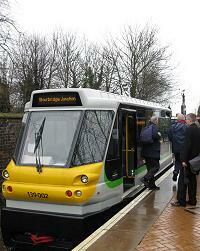 Rail travellers to Stourbridge must change at Stourbridge Junction to the short branch line to Stourbridge Town which (in 2011) is the only line operated by a 'Parry People Mover' vehicle, as seen above. Outside the station stands a modern sculpture. 'The Glass Blower' by John McKenna, which commemorates the town's traditional industry of glass-making. Stourbridge High Street, seen from the old Town Hall steps. The town has buildings from a wide range of periods, including Georgian. This view, from Mr Peacock's book, shows the War Memorial in is original location. The building behind is the Free Library and Technical Institute, built in 1905-6, partially funded, as were so many library buildings at the time, by Andrew Carnegie. The same view in 2010, looking across the relief road with its pedestrian crossings. The building was renovated for office use in 2009;the town's library and town hall moved some years earlier to a modern building in 'The Crown Centre'. We'd like to tell you more about Ernest W. Pickford, who designed the memorial, but information on him is proving a little elusive. Ernest Willie Pickford was born in 1880 in Manchester, the son of William Pickford, a 'fruiterer and confectioner', and his wife Emily, both natives of London who in 1881 are recorded at 33 Oxford Street, Chorlton-on-Medlock, one of a number of small shops on the site on which later appeared the Manchester headquarters of the BBC. In the 1901 census, Ernest (aged 21), still living with his widowed mother in Stretford, is listed as a 'Calico Printer's Designer' which would have been a common occupation for someone who studied at the Manchester School of Art. The census of spring 1911 has him living with his 'stepbrother' Sydney John Taylor at 23 Albemarle Street, Moss Side, Manchester and described as simply a 'Designer'. He married Helen Mary Shaw, a Derbyshire-born dressmaker, in Chorlton, Lancashire, in summer 1911. Some time after leaving Hill & Smith, where he was perhaps engaged in arnaments work during the war, and joining the Bromsgrove Guild of Applied Arts, Pickford returned to Manchester to work as the Guild's northern representative. It is recorded that the Guild had an office in Spring Gardens, Manchester, by 1914, but we have not confirmed that Pickford was there at that time. The Telephone Directory of 1923 lists Pickford at 76 Victoria Street, Manchester as 'Representing the Bromsgrove Guild.' The identical entries continue until 1939. 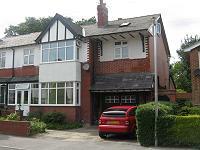 From the 1920s he lived with his wife and family at 19 Hazelwood Road, Woodsmoor, Stockport (seen above in 2011: it is a short walk from where this page is being created). This house and its neighbours were built circa 1908 on land bought from the widow of Alfred Cressy who had farmed the land in the area. After the outbreak of war in 1939, he left the Bromsgrove Guild and went to work at Mirrlees, Bickerton and Day's factory in Hazel Grove, near his home, whose output of large diesel and gas engines and generator sets was at that time totally directed to the defence of the country. He died on 21 December 1944. 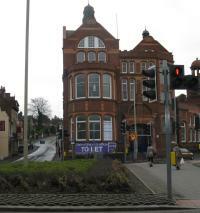 The Bromsgrove Guild of Applied Arts was founded by Walter Gilbert, headmaster of Bromsgrove Art School, Worcestershire, in 1898. It became a limited company in 1921, and continued in business until 1966; its most famous creations are perhaps the gates of Buckingham Palace in London, but it also carried out a number of commissions in the north of England, no doubt under the guidance of Pickford. In its early days the Guild included workers in various materials, but later it was known principally for archirectural metalwork. The Guild made the lamps for the extension of Mersey Square in Stockport in 1936, seen above in a Guild advertisment of the time. Other work with which Pickford may have been involved includes include war memorials (c. 1920) in the Manchester headquarters of the Refuge Assurance Company and the Calico Printers Association, silver altar ornaments for St Ann's Church in the city centre (1928) and notably two bronze figures representing 'water' and 'electricity' in the entrance hall of Stretford Town Hall (1934). In Liverpool, the guild made the famous 'Liver Birds' as well as the bronzework of the Cunard war memorial on the Pier Head. Wendy Robertson for her fine photographs. The staff of Stourbridge and Stockport Libraries. Built upon a concrete foundation, the monument has a granite base 8ft. 3 ins. by 6 ft. 9 ins. with a plinth of Darley Dale stone. At the front and rear of the lower portion of the plinth are two descriptive panels in bronze, one depicting infantry tanks, a despatch rider, etc., and the the other illustrating sailors manning a heavy gun on board a warship, both being suggestive of scenes of battle in which local members of the forces were engaged. Harmonising with these panels are two bronze inscription plates which are affixed to the sides of the plinth. Inscribed on one of the plates in low relief is the following: "These men fought and died on many lands and seas - France, Belgium, Italy, Russia, Greece, Turkey, Mesopotamia, Palestine and the North Sea." The other plate bears the inscription: "This Memorial was erected by public subscription to commemorate the heroism of the Rt. Hon. The Earl of Coventry, February 25th, 1923." Immediately above the bronze panels are bronze trophies surmounted by the main shaft, also of Darley Dale stone, on which are the bronze name plates. 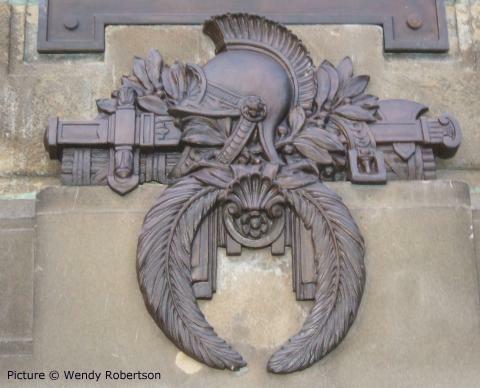 Over these are two bronze laurel wreaths, surrounding crests of the Worcestershire Regiment, and two bronze lions' heads, one each side of the shaft. 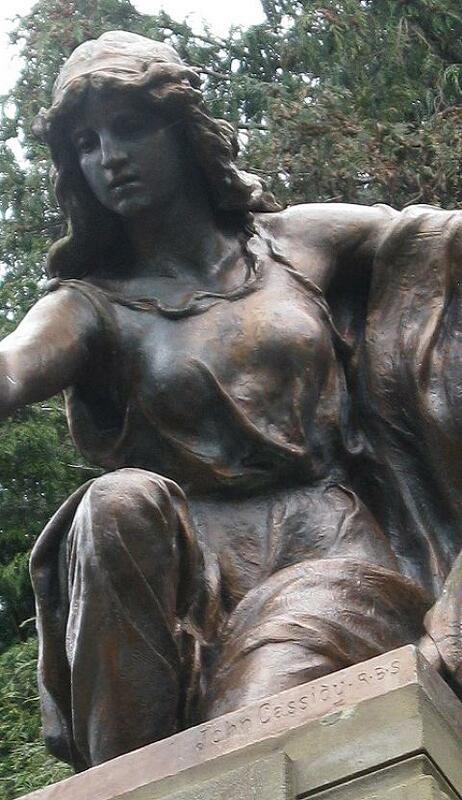 Resting on a moulded cap (just below which the key pattern is carved) at the head of the monument, is a fine bronze figure, representing Victorious Peace, stooping, and holding out a bronze wreath in her left hand, while the right hand supports the furled flag. The designer of the memorial is Mr Ernest W. Pickford... responsible for the design and all the drawings for the monument ... also the designer for the Memorial in the cemetery. Mr. John Cassidy, Fellow of the Royal Society of British Sculptors, modelled the statue and designed and modelled the descriptive and decorative bronze panels ... 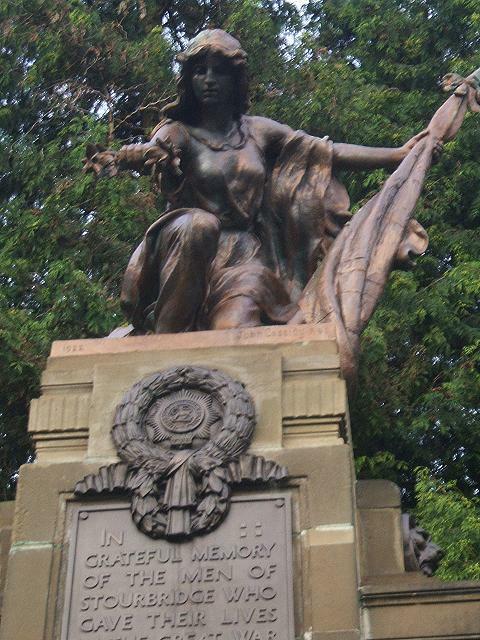 The rich metalwork of the Stourbridge Memorial was cast at Messrs. Martin's, Cheltenham, and by the Bromsgrove Guild. 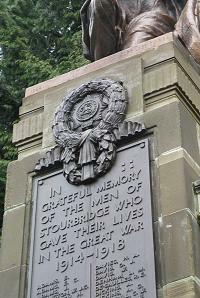 The Stourbridge Borough War Memorial Committee was established in 1919. Suggestions for memorials included a club-house for ex-servicemen, some form of sporting facility or an extension to the Corbett Hospital. Money for the project was raised by public subscription and the Committee succeeded in raising over £8,000. 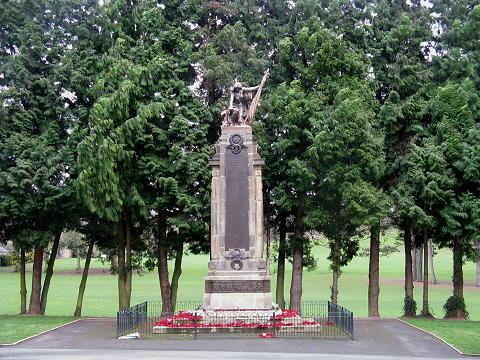 A cenotaph was built in the centre of Stourbridge Cemetery and a War Memorial Club with sports ground were purchased at Amblecote, but it was also decided to create a large Memorial in the town centre. 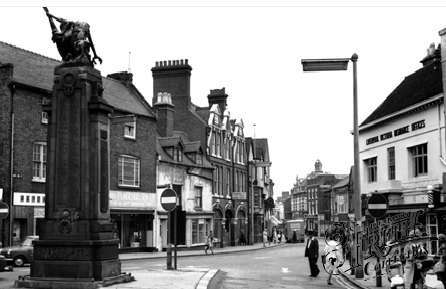 As at other towns, Committee face the problem of how to assemble the list of names of men born in Stourbridge to commemorate; families were encouraged to send names for inclusion as there was no central source of such information. Some names of men of the borough which appear on other local memorials in churches and elsewhere are missing, and there are names there whose stories researchers have been unable to trace. 377 names from World War I are listed on the bronze plaques, augmented by 135 from the Second World War which appear on additional plaques. The memorial is unique among Cassidy works in having a book devoted to it: The Stourbridge War Memorial: Remembering the Men of Stourbridge edited by local historian Roy Peacock for the Stourbridge Historical Society and published in 2005. 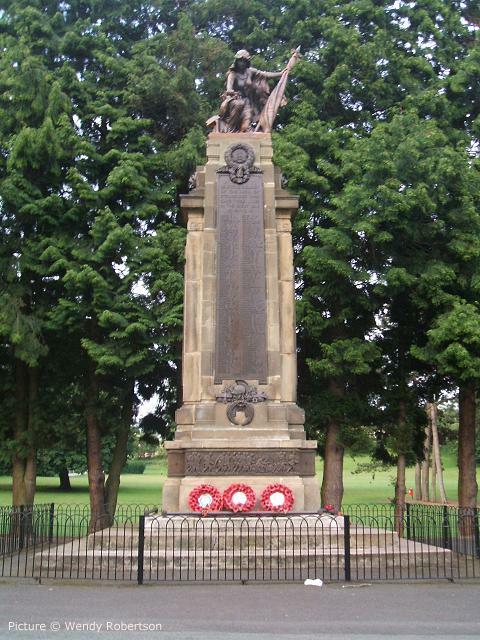 This book was followed by two more from the same source, tracing the stories of the men listed on the monument: Remembering the Men of Stourbridge: The Great War 1914-18 and Remembering the Men of Stourbridge: The Second World War 1939-45. There is also a website for the memorial, listing all the names, at www.stourbridge.co.uk. 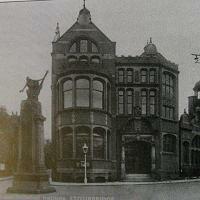 The memorial, which was erected by George Brown and Sons of Hagley Road, Stourbridge, monumental masons, originally stood at the south end of the High Street, at the junction with Hagley Road, New Road and Church Street. The old postcard reproduced above shows the scene in 1967, looking towards the town centre in the opposite direction from the pictures on the left. 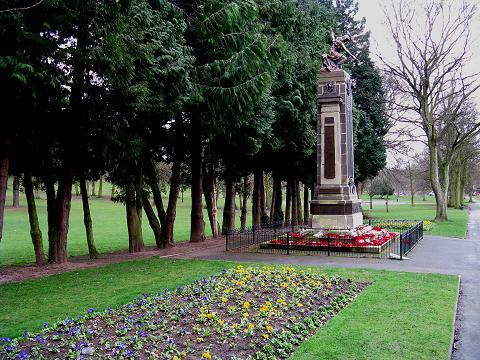 The traffic at this junction became increasingly heavy, and in 1968 the memorial was moved to its present position in Mary Stevens Park to make way for the 'inner ring road' and faciltitate the holding of Rembrance Day ceremonies. The Mary Stevens Park, on the edge of town, is an appropriate location for the memorial in that it is formed from the grounds of Studley Court, a mansion, originally the home of one of the town's glass-masters, which was used as a Red Cross hospital during World War I. After the war it became a boarding school run by Belgian nuns, until local industrialist Ernest Stevens bought the estate in 1929, and gave it to the town; the park is named for his wife Mary who died in 1925. The statue of 'Victorious Peace' set high above ground is not seen to best advantage by passers-by. The above view shows some of the details, and Cassidy's signature carved in the stone base which also carries the date 1922. She seems to be wearing a hair-net; this has perhaps been added by the Council as a pigeon deterrent. The work certainly has been kept in excellent condition. 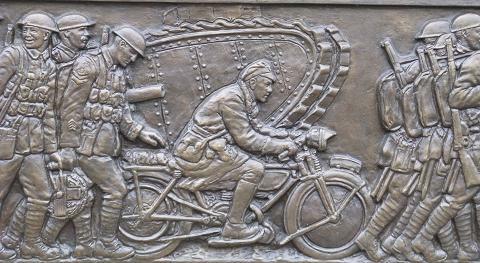 The relief panels, typical of Cassidy war memorials, with their accurate detail. The contemporary account seems to suggest that the panels and the statue were by Cassidy, the other metal adornments, such as the 'trophy' shown above, being designed by Pickford. Two views of the memorial in its context, Spring 2010. On 27 February 2011 a ceremony was held to dedicate a new plaque on the memorial, followed by a service at St Mary’s church, Oldswinford, to honour Private Shaun Taylor, killed in action while serving in the first Gulf War in 1991, aged 20. He was a member of the Staffordshire Regiment which formed part of the 7th Armoured Brigade, the 'Desert Rats' during the operation to remove Iraqi forces which had invaded neighbouring Kuwait. Back in 1916, my own grandfather, Private Albert Hulme of the Manchester Regiment found himself fighting in that same area, then known as Mesopotamia, He never appeared on any war memorial, although the war certainly shortened his life and he died before I was born. Richard Glazier, who in 1892 succeeded Cassidy's mentor R.H.A. Willis as headmaster of the Manchester School of Art, was primarily an architect - he wrote a classic textbook, A Manual of Historic Ornament first published in 1899 - but at the time of his death, while still in post, in 1918, he was said to be preparing a book on textile design. Hill and Smith, employers of Pickford, made fences, gates and similar items at their iron works, are still in business in 2011 making such items as motorway signs and barriers. Obituary of Ernest Pickford. Stockport Advertiser, 29 December 1944, page 4. Quintin Watt (Ed.) The Bromsgrove Guild: an Illustrated History. Bromsgrove: The Bromsgrove Society, 1999. Text, editing and uncredited pictures by Charlie Hulme, June 2011.